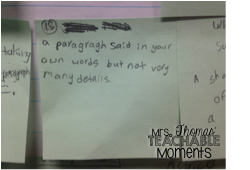 Mrs. Thomas' Teachable Moments: Summarize It! Oh summary. How I have such a love-hate relationship with you. Summarizing stories is something students start at a young age, and yet it is still so hard for students even in late elementary. I often find that they struggle to determine the important details from the minor details and write summaries filled with and then, and then, and then, and then, and then.....I end up feeling like Ashton Kutcher from "Dude, Where's My Car." 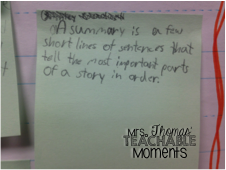 So, why do we teach summarizing? 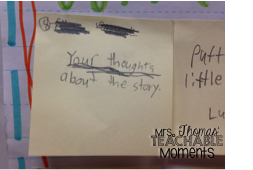 The ability to summarize builds comprehension. Summarizing a narrative text helps students comprehend the plot of the story. According to Fountas and Pinnell, good readers are always taking information from the text and condensing it into a summary-type form. As readers pull out the most important information, they are constantly interpreting what the author is telling them and further developing the summary of the story. 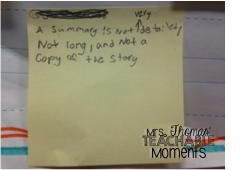 This year, I wanted to begin by seeing what the kids remembered about summary and clear up misconceptions before beginning the summarizing process. I made a simple chart with "What is a summary?" and "What is a summary NOT?" I wanted them to think about summaries from both sides. I gave them each a green sticky note first and asked them to tell me, in their own words, what they thought a summary was. They each came and added their sticky note to the chart. 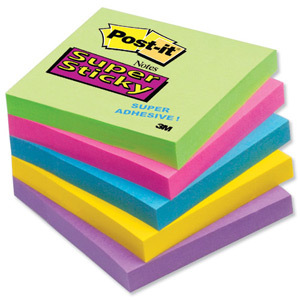 Then I gave them each a yellow sticky note and asked them to write down, in their own words, what they know is NOT included in a summary. Then they added their yellow sticky notes to our chart. We read a few of them aloud and saw that many of them had several of the same ideas. Here are a couple examples of what my students said a summary is. A summary is a few short lines of sentences that tell the most important parts of a story in order. A paragraph said in your own words but not very many details. And here are a couple examples of what my students said a summary is NOT. Your thoughts about the story. A summary is not very detailed, not long, and not a copy of the story. 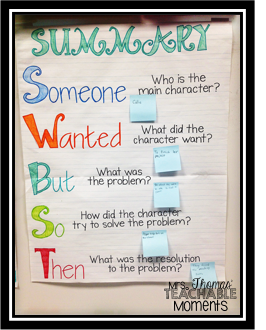 I like to use the Somebody-Wanted-But-So-Then (SWBST) strategy with students because it gives them a way to ensure they are looking for each piece of the summary every time they read a narrative piece. When teaching, I suggest lots of modeling, then move to group work before letting them summarize on their own. 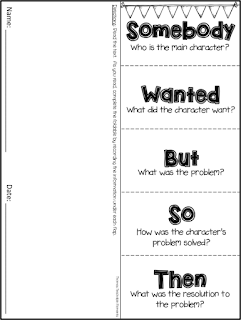 I discussed with them that when summarizing a narrative text, they should look for the main character, what the main character wants or his/her goals, the main problem he/she encounters, and the resolution of the problem. We summarized a short, one page text that we had previously read, about a girl names Callie who needed to complete a difficult homework assignment. (According to Fountas and Pinnell, you should begin with short texts that do not have many details). 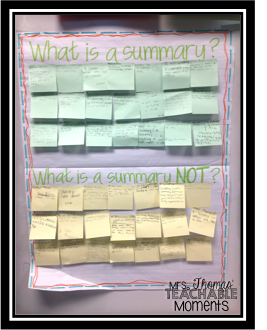 I modeled how to use the summary chart, and we looked for each piece as a whole group. I put a sticky note at each table group and tasked them with writing down the information for one component of the chart. One table wrote down the main character, one table wrote down what the character wanted, and so on. I have left this chart hanging in our room now so the students will have a visual reminder of how to get a summary! I also use a SWBST foldable with my kids. Anytime they read a story, they can fill in one of these. Doing this each time they read a book, (either a book from the library, a book you are reading aloud in class, during guided reading, a weekly story, etc) will solidify and fine tune their summarizing skills. It also reminds them that each time they read a story, this is the information they need to be looking for to fully comprehend the text. 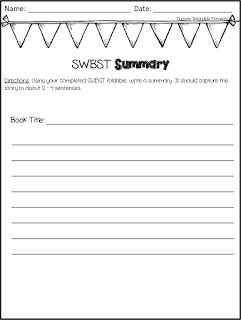 I also have a SWBST log that students complete each time they read a fiction book. This helps hold students accountable for reading and finishing a book, helps with comprehension, and simultaneously works on reinforcing summarizing skills. Many teachers do reading logs anyway where the students write down what they are reading, but this is a way to prove they have read the story, and shows if they understood what they read. Never miss a teachable moment!! 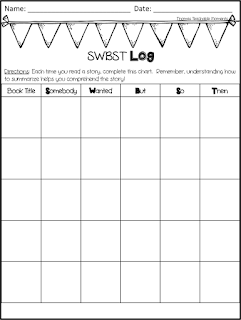 You can get this foldable and SWBST log as a FREEBIE in my store by clicking here, or by clicking the picture below! Enjoy! Awesome! I'm going to share this with the teachers I coach. 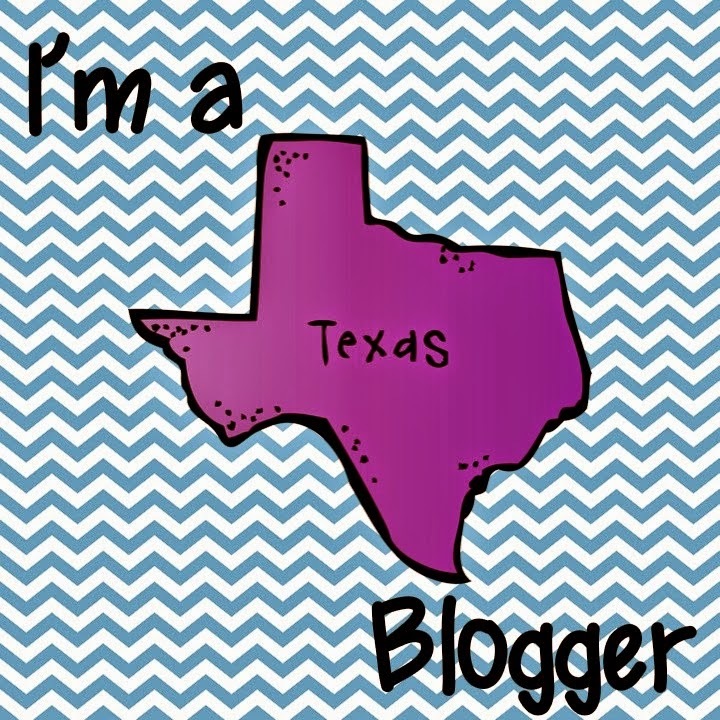 Thank you so much for the explanation of your lesson and printables. 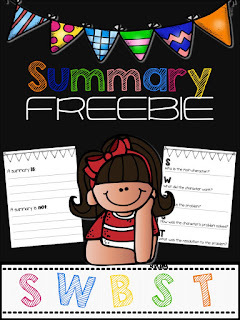 I'm a new teacher and was having trouble figuring out how to best teach summarizing. This is great thank you! I am in school to become a teacher and I have to "teacher" summarizing to my classmates. This was very helpful!